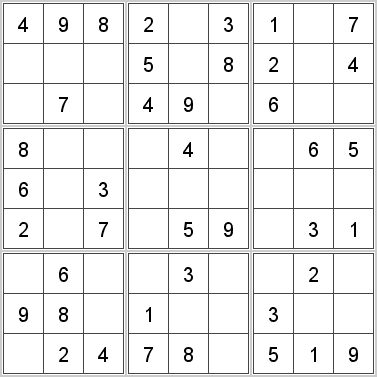 Sudoku rules are extremely simple. A square board is divided into nine identical 3 x 3 squares - there are nice cells in each of them. Your task is to fill all the cells of the board with numbers from 1 to 9. Each digit can appear only once in each row and each column of the board. Similarly, digits cannot repeat in any of the nine 3 x 3 squares. 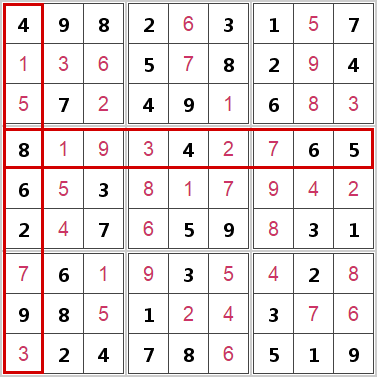 To solve the Sudoku puzzle you do not have to guess each digit - just follow the simple rules of logic. We will provide you with some basic guidelines so that you can solve your first puzzles faster on the example of Sudoku board number 1121552. Read them keeping in mind the rules of Sudoku mentioned above. The picture below is a section of a line of 3 x 3 squares of the sample board. The square on the left contains number 1 in the third row. The square on the right side contains number 1 in the first row. 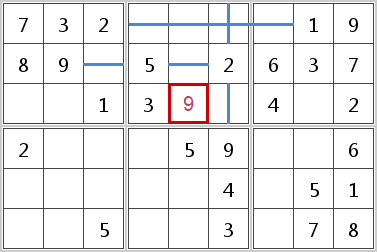 Since, as we know from the rules of Sudoku, every digit can only appear once in each row, number 1 cannot be placed in any other cell in the first and third rows. We also know that each 3 x 3 square must include all digits, so we must also place number 1 in the central square. 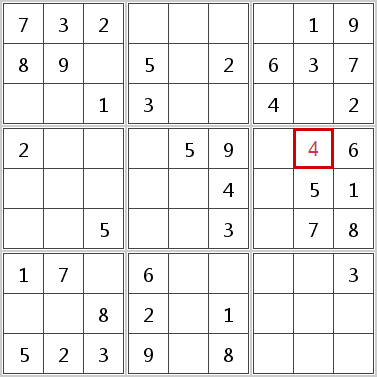 The only cell of the square where number 1 can be placed has been highlighted in the picture. Often it is necessary to combine information from 3 x 3 squares, rows and columns. The following section illustrates a situation in which the digit 9 may be placed in only one cell in a square. This cell has been highlighted in the picture. Finally, let's look at whole board. At first glance you can not see that only one digit can be inserted in the highlighted cell. Consider the options that we have to reject: numbers 1, 5, 6, 7 and 8 have already been placed in the 3 x 3 square; numbers 2 and 9 can not be inserted due to their presence in the same row; 3 also can not be used because it is already in the same column. The only possibility for this cell is the number 4. 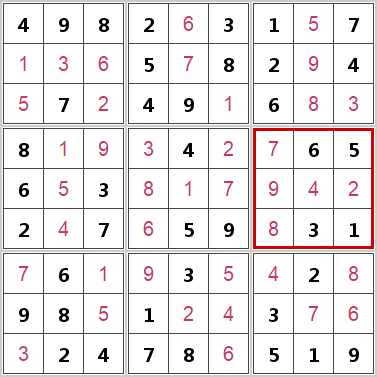 Every correctly filled cell is a key to solving the next, unfilled cells and the whole Sudoku board. These principles and guidelines will be enough for you to solve easier Sudoku boards and will be useful for solving higher difficulty boards. Remember that you should not guess - all the information you need to complete the game are on the board. Over time, and with each subsequent game, you will build your own set of logical tools that will allow you to efficiently and quickly solve the next, more difficult puzzles.